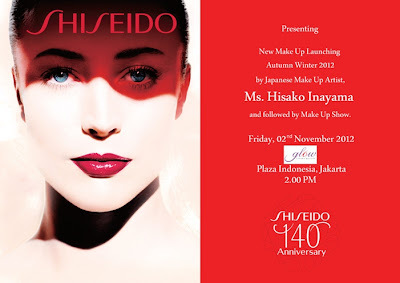 So, On last Friday, I got an invitation from IBB to Shiseido New Make Up Launching Autumn Winter 2012 at Glow Plaza Indonesia, Jakarta. There were a lot of other fellow beauty blogger who attended the event at that time. And yes, I was so excited since I met so many new friends! Well, I came too early that day, yeah I was done with an interview in Mampang and just headed to Plaza Indonesia afterwards. I came at 12 pm -_-. So, when I walked past by the Glow, I saw there were only empty chairs there so I ran to the rest room to fix my make up. Then I came around 1 pm and I met Marsha and her friend, they came early just like me. Finding that there's nothing to do, so I walk around took some pictures there. So the event started a bit late, then the MC entered and say hi to all of us. There was an awkward moment when the MC call us as fashion bloggers instead of beauty bloggers, and it was not only once.. Haha, I looked around and everybody's face was sour. Then Ms. Sien Lie, Shiseido's MUA joined the MC and talk about the latest collection of Shiseido. And I spotted a very nice shoes on her! Haha, It was really cute yet stunning. Next, the IBB staff stepped forward and gave testimonials about Shiseido products worn by them at that time. Below, Carnellin, Nisa, and Phanie were wearing Shiseido Lacquer Rouge. Soon after, Ms. Hisako Inayama; Japanese Make Up Artist joined MC and I gotta say that she's so cute! I wonder if typical Japanese laugh so much when they're nervous. But it's cute anyway. :p Then, the make up show started! I have to agree that this model was the fiercest of all! Me before Lacquer Rouge. Haha, there was lip tint left. wearing Shiseido Lacquer Rouge RS 404! Aaaak I love how intense the color was! Me and Meylisa, sorry for the blurry picture! After the event ended, there was a small giveaway by the IBB staff. I raised my hands around 3 times and when I finally got the chance, I answered it wrong. -_______- Well, not my lucky day. So, me, Lele, Via, Mels, Roma, Jesslyn, and Nita decided to have some meals together. We chose to eat in Grand Indonesia. Funny thing was when we all drove on Lele's car. You know the spin on the parking area in most of the malls right? It was never ending spin and we all felt like we're riding roller coaster. LOL, you know it when a bunch of girls hang out together right? It's noisy and loud. Anyway, I had fun that day. And not to forget about the freebies from the event. I got a self-picture at the photo booth, an energizing fragrance, men's fragrance, mini compact powder and sachet samples.